The new Steinway concert grand will reside in the concert hall of the Mahaney Center for the Arts. MIDDLEBURY,Vt. -- The Mahaney Center for the Arts was buzzing with excitement on Tuesday, Nov. 26, as the college welcomed the arrival of a new Steinway model D concert grand piano. The piano, a gift of the Ray, Meredith and Nathaniel ’12.5 Rothrock family in honor of President Ron Liebowitz and his wife Jessica, will reside in the concert hall for use by students, faculty and the world-renowned pianists who appear as part of the college’s Performing Arts Series. A small gathering of students, faculty and staff watched as a crew from Green Mountain Piano Moving brought the glossy black 9-foot, 990-lb. piano into the concert hall, installed its legs, and carefully turned it upright. The new piano was handcrafted at the Steinway factory in Queens, N.Y. A selection committee that included Steinway artists and concert soloists Richard Goode and Paul Lewis; Middlebury faculty member Diana Fanning ’71; and alumna Gwendolyn Toth ’77, traveled to the factory in late October, where they tested five pianos chosen to suit the acoustics of the Mahaney Center concert hall. Jessica and Ron Liebowitz admire the new piano with Director of the Arts Pieter Broucke. Lowell Trecartin of Green Mountain Piano Movers installs the legs. 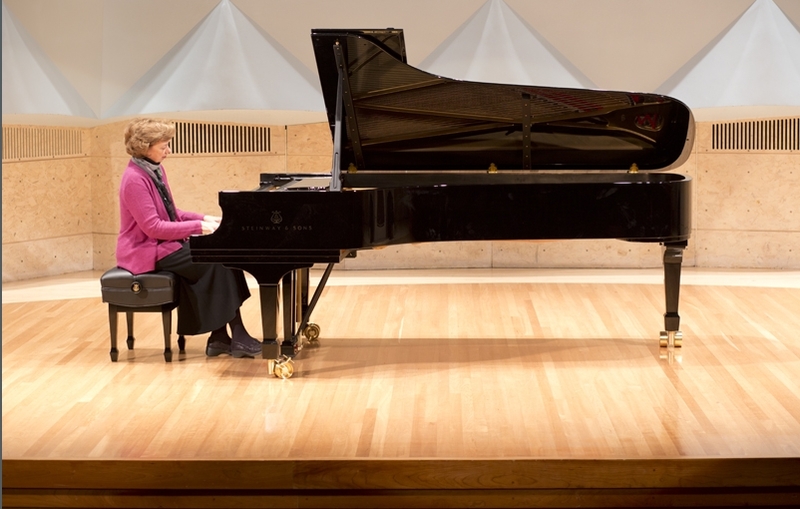 Affiliate Artist and Piano Instructor Diana Fanning ’71 was one of the first to play the new Steinway. Affiliate artist and piano instructor Diana Fanning was among the first to try the new instrument, playing a Brahms Intermezzo before a small, but rapt, audience. "It feels and sounds wonderful," Fanning said. "It's just as good as I remember from the Steinway factory." The current concert hall piano, also a Steinway, will be moved to Mead Chapel, where it will continue to be an important performance instrument, though with a much less demanding schedule than the main concert hall piano. That piano, a gift of former trustee Patricia Palmer ’57 and family, arrived in 1992 for the opening of the Mahaney Center for the Arts. Steinway pianos are renowned as the piano of choice in concert halls around the world. Each piano contains more than 12,000 parts, and the painstaking manufacturing process takes nearly a year to complete. A dedication event for the Liebowitz piano is being planned for spring 2014.